A Coronary Calcium Scan looks for specks of calcium (calcifications) in the walls of the coronary (heart) arteries. These calcifications are an early sign of coronary heart disease (CHD). In Coronary Heart Disease (CHD), waxy or fatty deposits (known as plaque) build up in the walls of the coronary arteries (the arteries of the heart). This may cause vessel narrowing, reducing the flow of oxygen-rich blood to the heart, resulting in chest pain or discomfort called angina. They may also rupture, with a blood clot forming on the surface, which may partly or completely block the coronary artery. This is the most common cause of a heart attack. 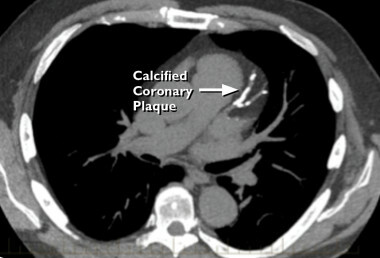 Over time, calcifications form in these coronary artery plaques, which can be detected in a Coronary Calcium CT Scan, often long before a patient even experiences symptoms. Low dose CT can accurately detect and quantify calcified coronary artery plaque, allowing coronary risk stratification. A positive scan confirms the presence of coronary artery disease. CHD also can lead to heart failure and arrhythmias. Heart failure is a condition in which your heart can’t pump enough blood to meet your body’s needs. Arrhythmias are problems with the rate or rhythm of your heartbeat. What is a coronary calcium score or scan? A coronary calcium score is a special type of multidetector CT scan that measures the amount of calcium present inside the coronary arteries. The scan uses x-rays to create detailed pictures of your heart and arteries. The calcium score is used to predict your risk of heart attack or other heart problems before other signs and symptoms occur. A coronary calcium scan is a fairly simple test. You will lie quietly in the scanner machine for about 10 minutes while it takes pictures of your heart. Who should consider having their calcium scored? No caffeine, smoking or exercise for 4 hours prior to your appointment. For the scan, you will remove your clothes above the waist and wear a hospital gown. You also will remove any jewellery from around your neck or chest. The technician who operates the scanner will clean areas of your chest and apply sticky patches with sensors called electrodes. The patches are connected to an ECG (electrocardiogram) machine. The ECG will record your heart’s electrical activity during the scan. This makes it possible to take pictures of your heart when it’s relaxed between beats. The CT scanner is a large machine that has a hollow, circular tube in the centre. You will lie on your back on a sliding table. The table can move up and down, and it goes inside the tunnel-like machine. The table will slowly slide into the opening of the machine. Inside the scanner, an x-ray tube will move around your body to take pictures of your heart. The technician will control the CT scanner from the next room. He or she will be able to see you through a glass window and talk to you through a speaker. The technician will ask you to lie still and hold your breath for short periods while each picture is taken. The coronary calcium scan will take about 10 minutes, although the actual scanning will take only a few seconds. During the test, the machine will make clicking and whirring sounds as it takes pictures. The scan causes no discomfort. 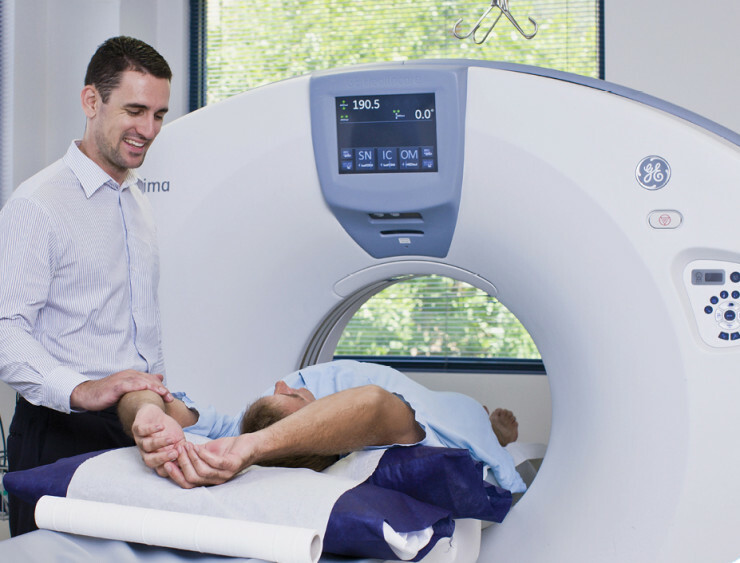 You will be able to return to your normal activities after the coronary calcium scan is done. Once the test finished please make an appointment to see your Doctor to discuss the results. The results of your study will be available for your Doctor to review within 72 hours of the completion of the test. Please bring any previous imaging with you on the day of your examination. If you have any questions please don’t hesitate to ask us!